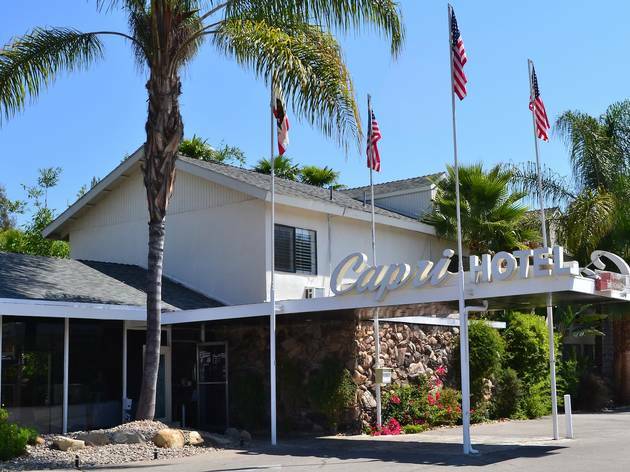 The Capri Hotel is a reasonably priced option in Ojai with mid-century style, clean rooms and a location that's walking distance from downtown. The lobby plays reruns of old, black and white sitcoms and offers up a respectable (and free) continental breakfast each morning, as well as a hilarioulsy curated selection of VHS tapes for guests to borrow, with titles such as Wayne's World, Jurassic Park, Coneheads, Groundhog Day—you get the picture. There's a bottle of local wine in each room's minibar, and the beds are comfy and firm. 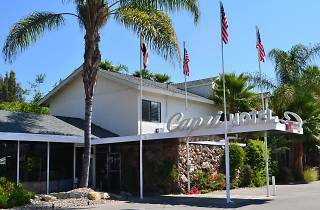 The pool area is a little rundown—when we visited, 4 out of the 14 lounge chairs were broken—but there are shady cabanas, big umbrellas and a huge lawn for bocce ball, croquet or rowdy kids. The hotel is especially kid-friendly (there's a wading pool just for little ones), so if you're not into under-12s, you may want to choose another spot.